Five meals, one grocery list. Hey! I'm Hannah. For me, living in NYC, it's very temping to eat out or order delivery most nights. It's convenient, it's fast, and it's one less thing to worry about after a long day of work. But admittedly, the cost can really add up, and it's a habit I know I need to curb. So when I was asked to make a week of homemade dinners for $30 or less, I knew it'd be a challenge for me. I've definitely been trying to make a conscious effort to cook more at home during the work week, but I still typically spend at least triple that on my weekly grocery run. Since I was most unsure about the budget, I worked backwards. First I wrote a list of several of my favorite ingredients that I knew I could use in different ways — then browsed around for recipes with them. During a typical week, some of my staples are vegetables, eggs, grains (like quinoa or pasta), seafood, and chicken. I very rarely eat red meat, and I try to eat a vegetarian meal at least one night per week. There were a few ingredients where I wasn't able to find the price online, but I did my best to estimate what it might cost. Also: my meals were for one person/serving, but most ended up being enough for two — or for leftovers. Then I hit the store on Sunday. I usually shop on Sundays so I can have time to meal prep and make a cooking schedule for the week ahead. My grocery store of choice was Trader Joe's, since it's often one of the cheaper options in town. 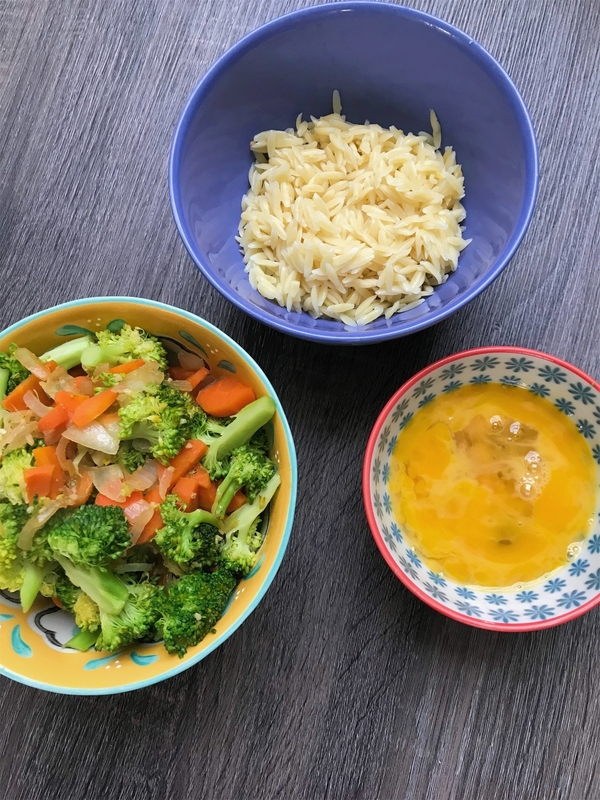 I had some staples already in my pantry like rice and pasta that I could have used this week, but for the purpose of this experiment, I only used what I bought at the store — except for olive oil, seasoning (salt, pepper, red pepper flakes), and soy sauce. At home, I laid out all my ingredients and figured out what I could prep ahead of time. Then I spent about 40 minutes getting everything set. Here was my menu for the week. With Sunday's prep, no meal took longer than 30 minutes to make. 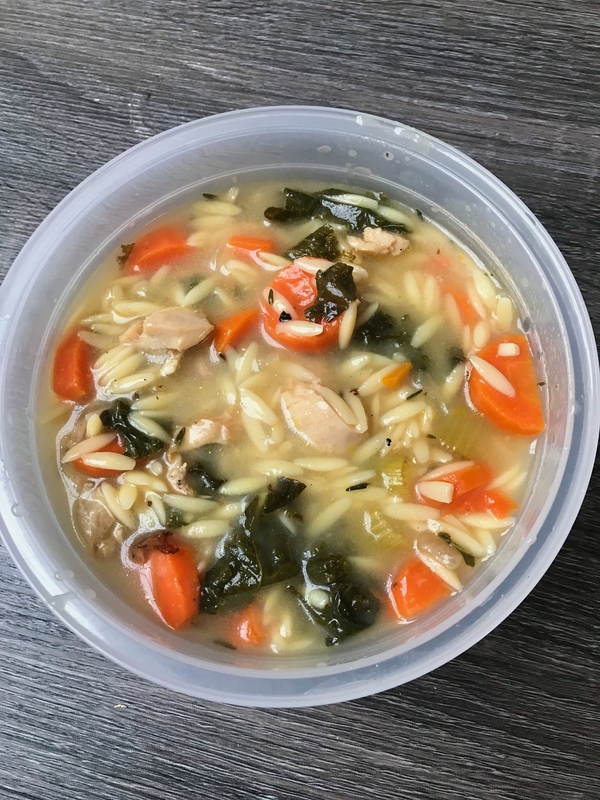 I ordered these recipes based on what I thought I'd be in the mood for as the week went on — starting Monday really easy (pre-cooked orzo + veggies), breaking up the week with vegetarian options, and doing a big batch of soup leading into the weekend. But you could mix and match these any way you wanted. You would just need to adjust small things. For example: I bought a slightly underripe avocado, knowing I wouldn't use it until Wednesday. And I froze half the chicken, because I wouldn't use it until Friday. Here's how the week went! Mondays are... well, Mondays. After a long day at work, I'm craving something comforting and not too time intensive: orzo fried rice. 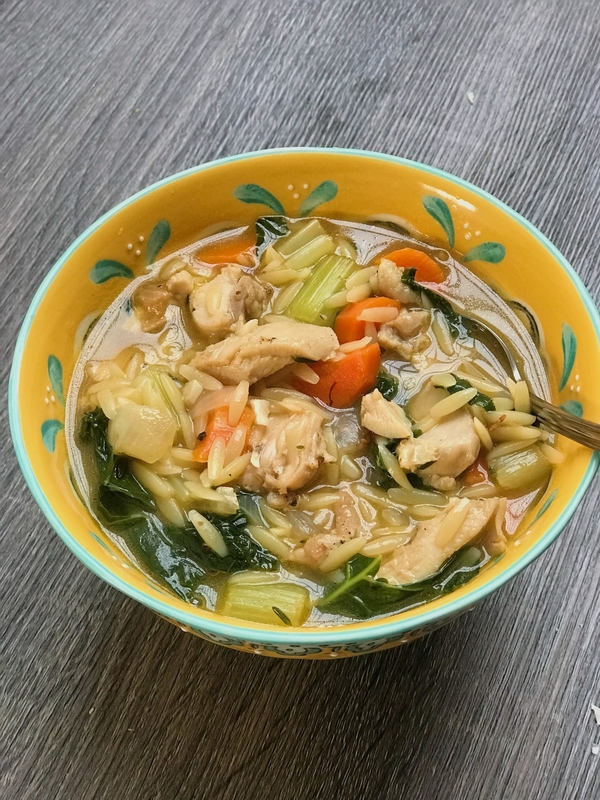 Since I had already chopped my veggies and made the orzo on Sunday, this meal couldn't have been easier. 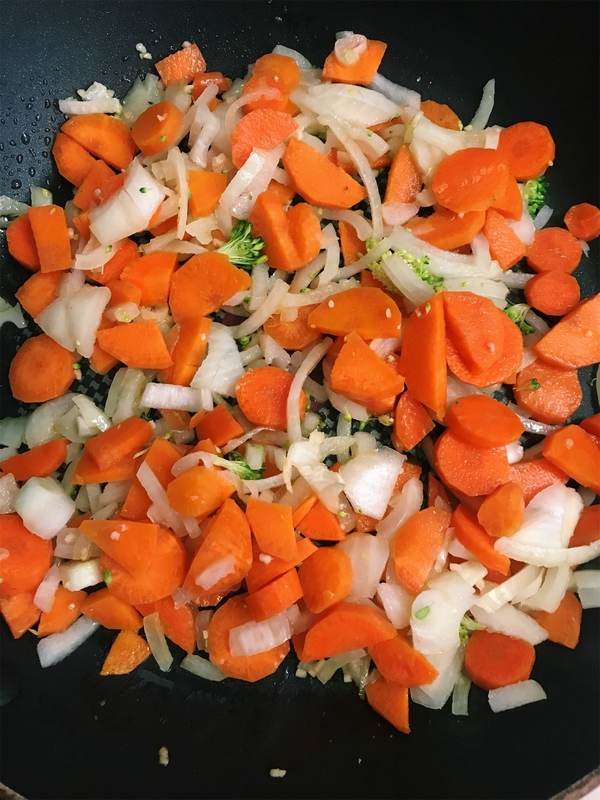 Roughly following this recipe, I sautéed chopped carrots, onions, garlic, and broccoli on the stove. 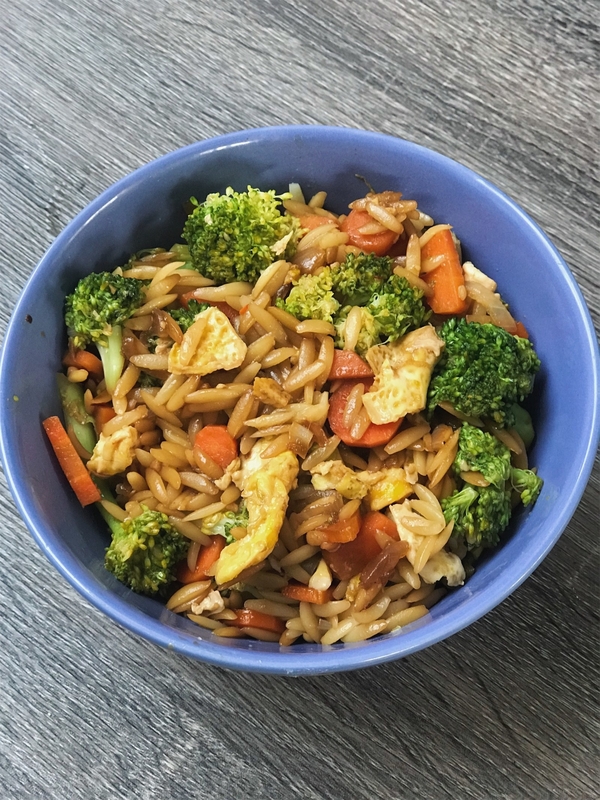 Once tender, I added the orzo and tossed the mixture in soy sauce, salt, pepper, and red pepper flakes (all of which were staples in my pantry). 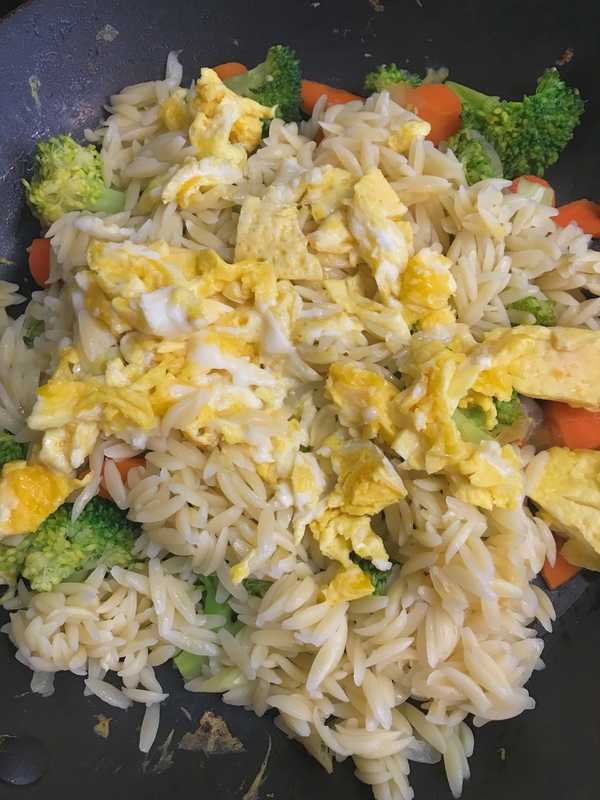 I scrambled an egg and added it to the veggies and orzo. Since I meal prepped, the whole thing took barely any time. I also made enough for two, so my boyfriend happily devoured the other half. I was starving when I got home, so I wanted to make a filling meal. 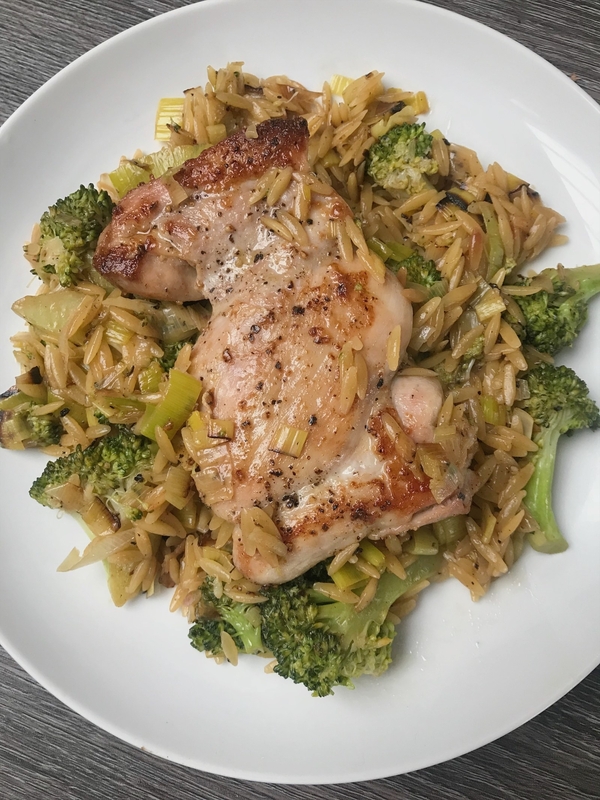 Enter: an orzo, broccoli, and leek skillet, topped with crispy chicken thighs. 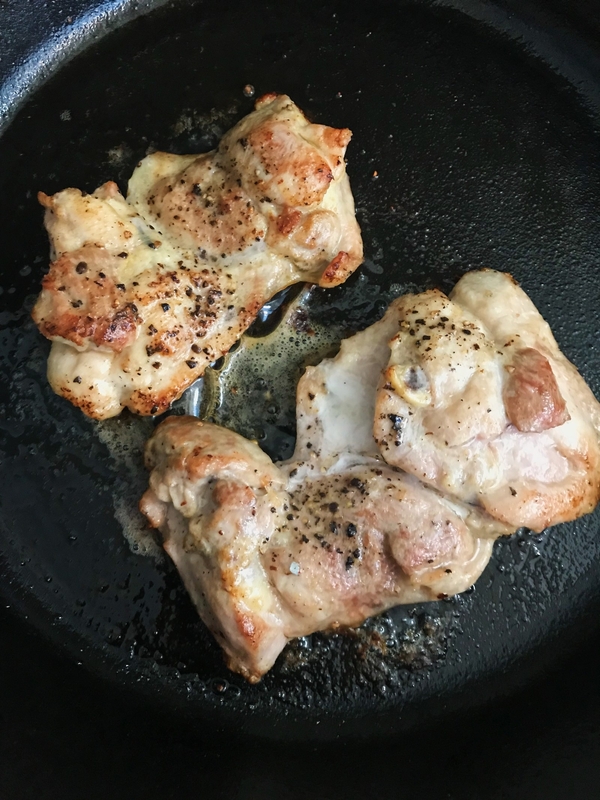 Inspired by a recipe I saw on Bon Appetit, I cooked the chicken thighs in a cast iron skillet, then I finished it off in the oven until it turned golden and crispy on the outside. 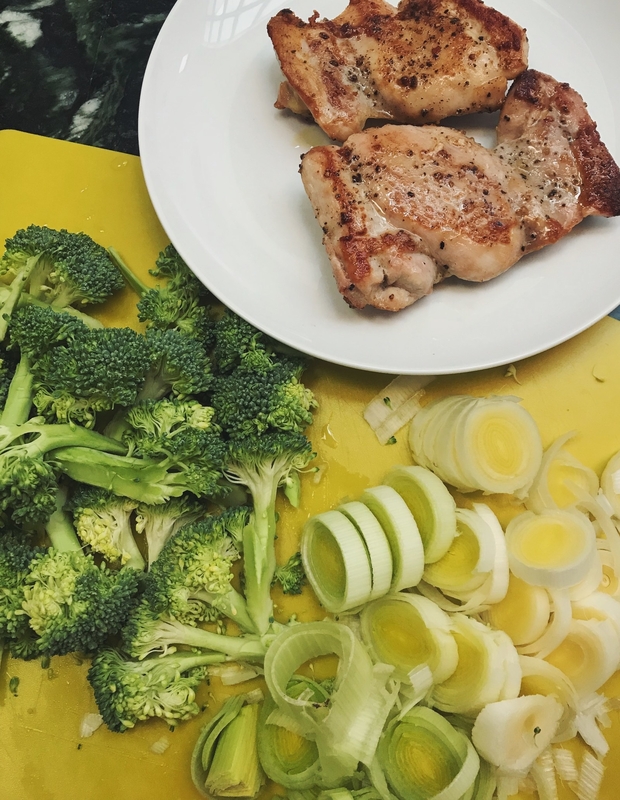 Then, I took my pre-chopped broccoli, leeks, and onions, and sautéed the veggies in a skillet with chicken broth, lemon juice, salt, and pepper. Again, this recipe made enough for two, so I ate half of it for dinner and packed the rest up for lunch the next day. Having eaten a bunch of orzo and chicken so far this week, I was craving something a bit lighter on Wednesday. 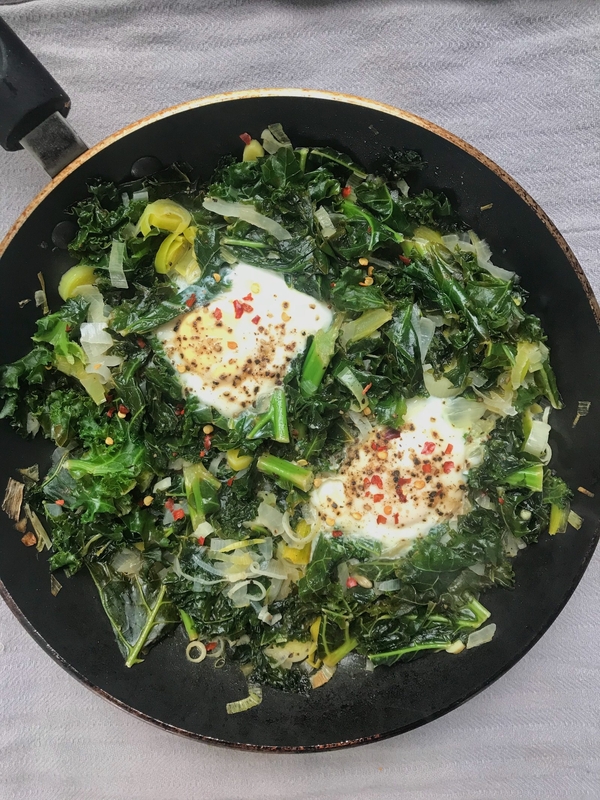 I made sautéed kale and leeks with baked eggs (sort of like a green shakshuka, if you will), inspired by this recipe. 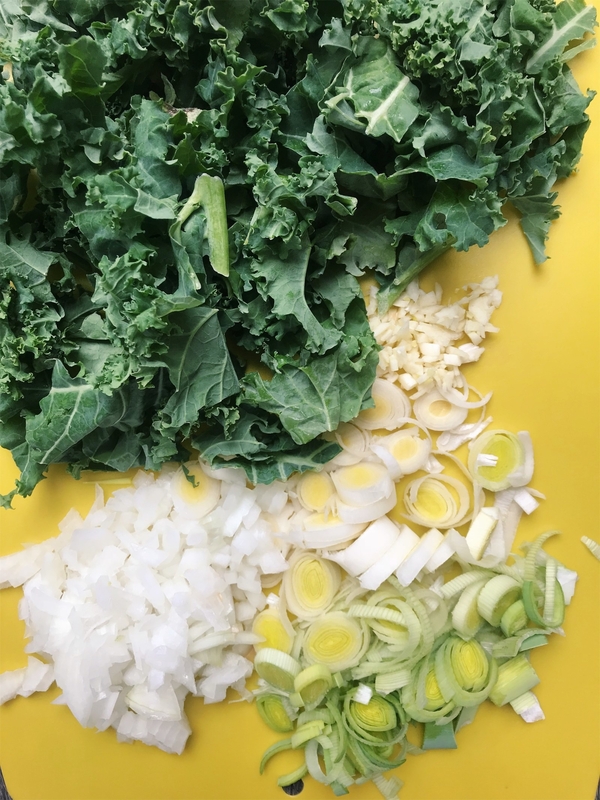 I sautéed kale, chopped leeks, onions, and garlic in a pan with chicken broth. 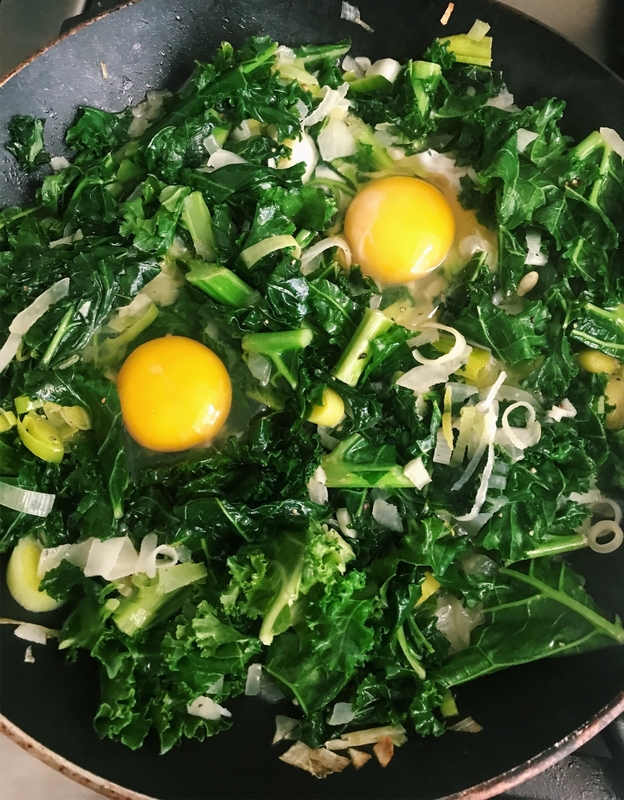 Once the kale was wilted and all the veggies were tender, I made two little pockets in the greens and cracked two eggs, then covered the pan and let the eggs cook for about five minutes. 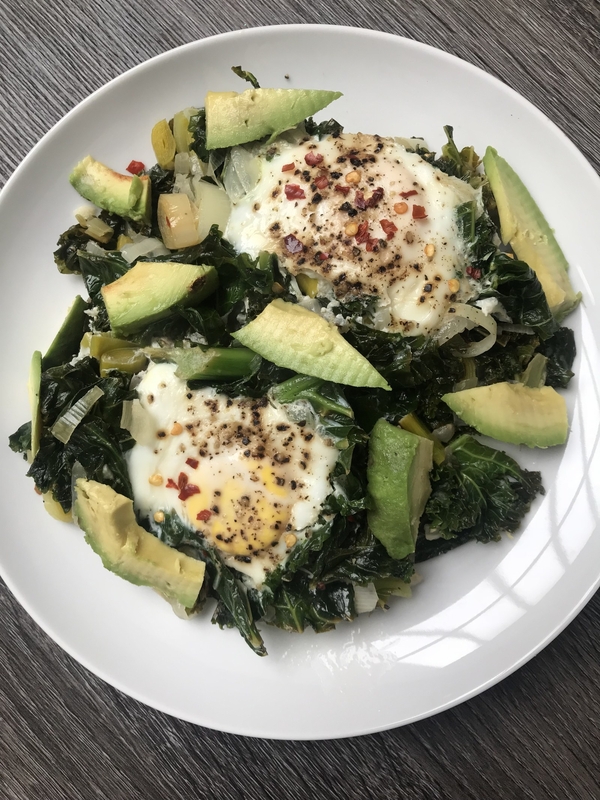 I topped the egg skillet with some lemon juice and red pepper flakes, then sliced some avocado to make the meal a bit more filling. 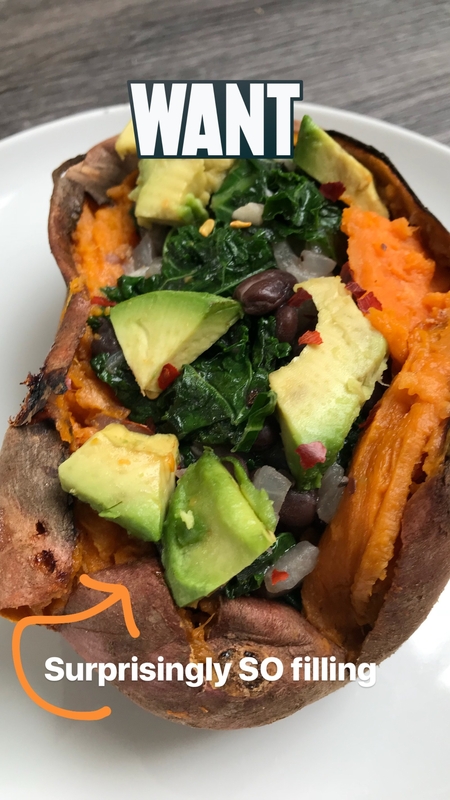 Stuffed sweet potatoes are one of my go-to weeknight meals because they're so easy to make and really versatile. You can really make them using whatever is in your fridge, but I chose to follow this recipe. 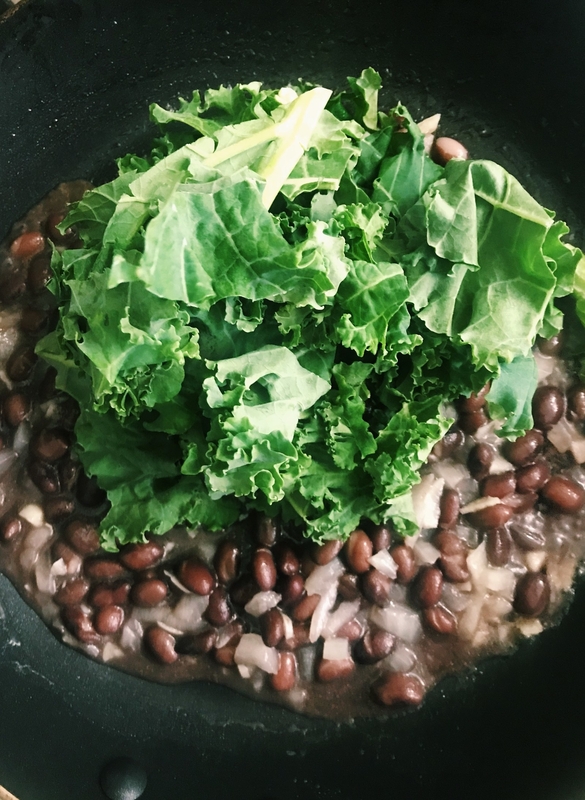 While my sweet potato baked in the oven, I sautéed canned black beans with some garlic and onions — and added salt, pepper, and red pepper flakes. Then I filled the baked sweet potato with the bean mixture and topped it with avocado, which I had left over from the night before. This ended up being super filling thanks to the black beans. But if you felt like you wanted even more protein, you could top the sweet potato with a fried egg. It was the last night of cooking, and I was feeling surprisingly confident about the week had gone so far. Friday night happened to be absolutely freezing, so I couldn't have been happier about making a piping hot bowl soup for dinner. Following this recipe, I started by cooking the chicken in a stock pot with some olive oil. Once cooked, I put it to the side and sautéed the vegetables until tender. I added chicken broth and water and brought the pot to a boil. 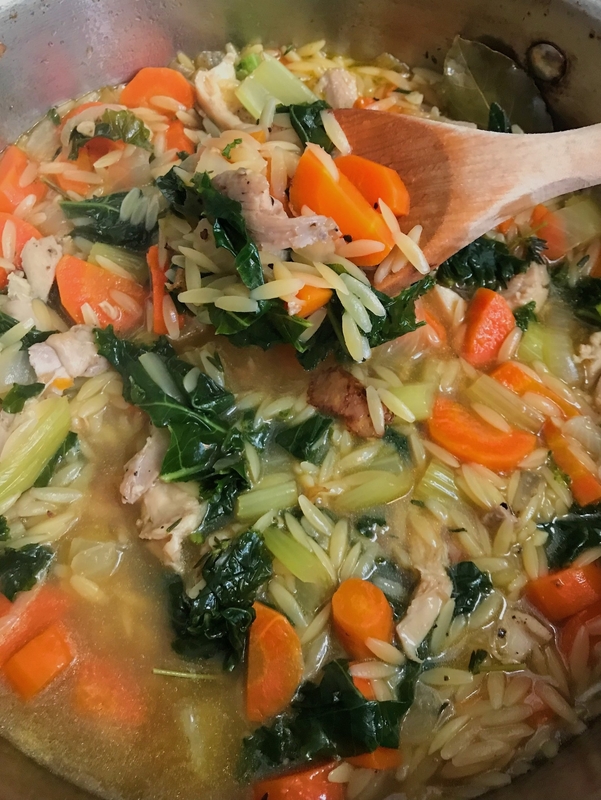 Then the orzo and chicken — and simmered everything until the pasta was cooked. I finished it off with lots of lemon juice and a little salt and pepper to taste. As you can probably tell, this recipe made a massive pot of soup... far more than a single serving. 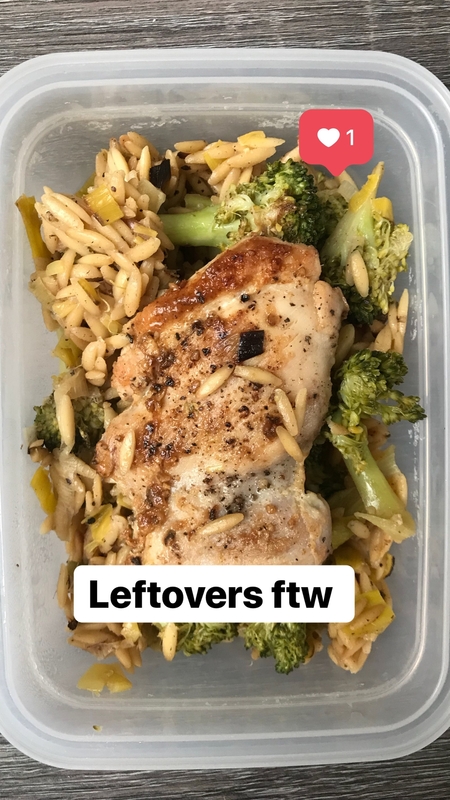 I ate one big bowl and then I filled another Tupperware with the leftovers. I figured if I didn't eat it by the end of the weekend, I could freeze it and save it for an easy work lunch the following week. All in all? The week was actually a lot easier than I was expected. While the $30 is less than I normally spend, it turned out not to be an issue. Most meals made two portions (or leftovers), and for the ones that didn't, I could have easily fed both me and my boyfriend for just a few bucks more. And the best part is that after cooking at home for a week, I had zero guilt about splurging on a nice meal out on Saturday night. 1. Put thought into planning your grocery list: ✍🏻 If you go to the grocery store without a plan, you'll find yourself buying lots of extra ingredients and items that don't necessarily work together. Fine-tuning your grocery list before you shop will help you stay organized, focused, and within your budget. 2. 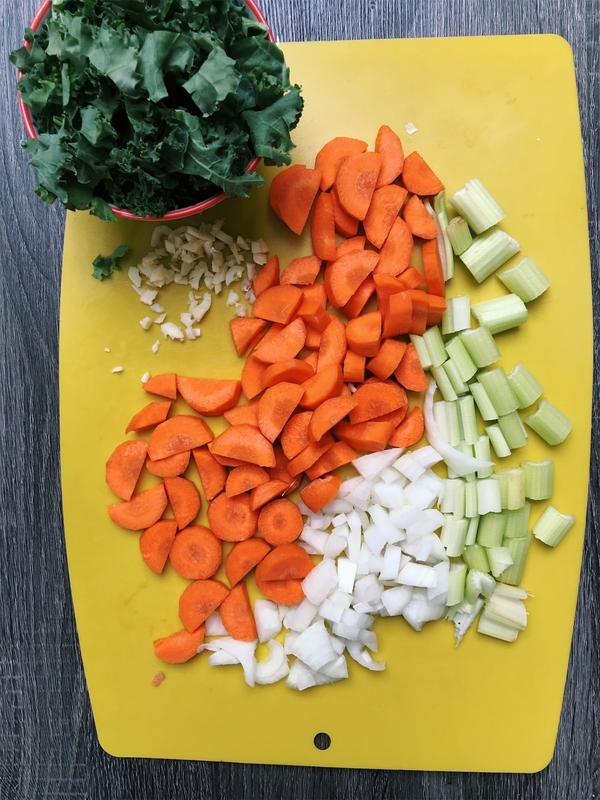 Mix in a few vegetarian meals: 🥕 When it comes down to it, meat is usually the most expensive thing in your grocery cart — so it helps to have some great vegetarian staples on hand. While you probably won't be able to buy fancy cuts of meat or fresh seafood on a budget, there are also lots of affordable meat options to consider adding to your grocery list like ground meat, canned tuna, frozen cod fillets, or frozen meatballs. 3. Meal prep as much as you can. 🥣 If you know one night of your week tends to be busy, try preparing as much as you can ahead of time to reduce your cooking time. 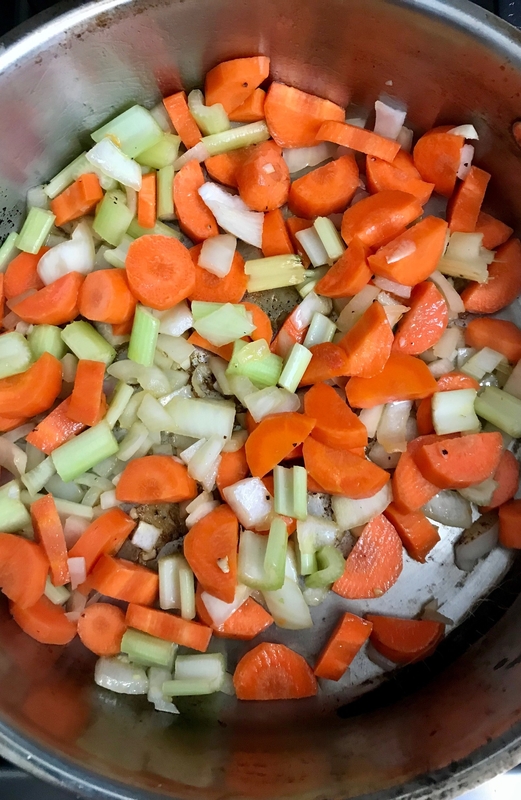 Chop any veggies, make any grains in advance, and even cook meat the night before so you can re-heat it on a busy night.